Swissotel Merchant Court offers spacious 5-star rooms, a 5-minute walk from nightlife options and Clark Quay MRT Station. Overlooking the Singapore River, it has a landscaped pool and 24-hour gym. Featuring modern furnishings, rooms at Merchant Court Swissotel have over-sized windows with clear views of the pool, river or city skyline. Enjoy the comfort of free tea/coffee-making facilities, carpeted floors and marble bathrooms. Featuring a hot tub and slide, the outdoor pool is ideal for a lazy afternoon in the sun. Alternatively, work out in the 2-story gym or relax with soothing massages at Amrita Spa. Daily buffet spreads with international dishes and delicious local specialties are featured at Ellenborough Market Restaurant. Blue Potato serves various Western dishes by the poolside. Drinks are available at Crossroads Bar. 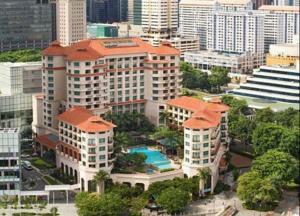 Swissotel Merchant Court Singapore is a 25-minute drive from Changi International Airport. Orchard Road and the central business district are a 10-minute drive away. Rooms: Hotel Rooms: 476, Hotel Chain: Swissôtel. 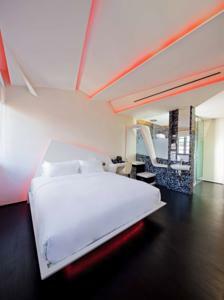 Wired internet is available in the hotel rooms and costs SGD 19.26 per 24 hours. Free! One child under 12 years stays free of charge when using existing beds. Free! One child under 2 years stays free of charge in a baby beds. The maximum number of baby beds in a room is 1. Any type of extra bed or crib is upon request and needs to be confirmed by management.